A new driver board for Cobalt digital IP motors is now available from our web shop. 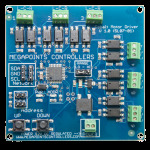 The driver module can control up to six Cobalt digital IP motors and integrate them into our control system. You can read about the product and watch the introduction video here.